This week: a blended show. Food Network superstar and bestselling cookbook author Giada De Laurentiis speaks from the heart in our first two segments for a show we recorded on location in Madison, CT. Giada shares recipes for Cacio e Pepe, Grilled Scallops with Prosciutto, and Grilled Chicken Involtini. Then, Faith and her food buddies round out the show by going crazy over corn. 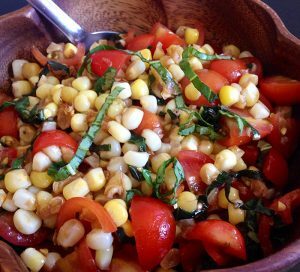 Recipes and ideas include corn salads, corn carbonara, and a savory corn pudding. What are you making with fresh corn right now that’s a little out of the ordinary? Share it with us!